For a bit of fun and motivation, I've joined "Dieting with Blogger Babes" that Sharon from Red Geranium Cottage has started. Stephen and I have both made the decision to get back on track when it comes to weight and health. Stephen managed to keep his weight gain to a minimum, myself, let's not go there. But..... I am determined. Stephen and I are following the South Beach Diet. Simple is best for me! I was never one to keep tads on my points and what not. The first two (2) weeks is a detox program whereby you cleanse your body of carbs and sugar. This means no pasta, bread, alcohol, fruits and any type of refine sugar or processed foods. What I like about this program is that you're not hungry all the time and it's easy to follow. Last night we had baked Cajun spiced salmon with roasted Brussels Sprouts and cauliflower with lemon and garlic. 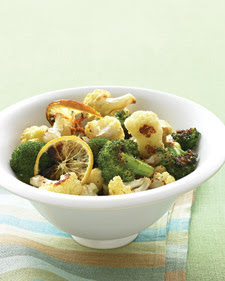 The recipe is an adaption of the original recipe roasted broccoli and cauliflower with lemon and garlic found in the December 2008 issue of Everyday Food. I love that magazine! Preheat the over 475F - place vegetables, lemon and oil on a cookie sheet - toss - season. Roast until brown and tender approx 25 to 30 minutes. Toss vegetables mid way. If you do a search on the Everyday Food site you will have the original recipe with "per serving" data. It's a great magazine and I invite you to check it out. Lots of wonderful easy to make recipes. 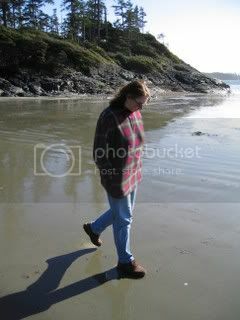 As for a picture of myself, no I'm not brave enough. Besides, you all know what I look like. Thanks for stopping by! You have yourself a great day! Happy New Year Carole! Love the quilt from the last post, so pretty. Good luck with the diet, I wish my DH was the cook in the family! This challenge I SHOULD join but I am not brave enough. Thanks for the recipe...looks yummy...I love veggies. Okay, let me get this straight, Stephen makes beautiful furniture, remodels beautiful rooms AND cooks! Good Luck! I lost 35 lbs on the South Beach, 3 years ago. I have keep most of it off, but not all. I am working on losing that again and hopefully a few more to go with it. That first two weeks is a killer for me. Your meal sounds wonderful! Salmon and roasted broccoli and cauliflower would be pure heaven. I have roasted cauliflower for years and my daughters love it. They now make it for their friends as a snack. Just cracks me up. Wishing you the best with your goals for 2009! Did you say NO alcohol??? OMG!!! LOLOL!!! You are truly serious arent you?? The veggies look yummy. You can do this I know you can. Oooh, that recipe looks yummy. I love cauliflower, but I always forget to buy it. Good Luck on the diet! Best wishes for the New Year, Carole! You and Penelope are turning out some great works of art! Good looking recipe! I wish you lots of luck! Come visit... even though I am a "points girl" maybe something you see will work for you too. When you come to mybrownbagstudio, click on the yellow ribbon on the left and it will bring you to myweightisover. Yum, I roast veggies all the time but had never thought to put in a lemon. Gotta give that a try! Thanks for the suggestion. I can relate to your iron issue- I did get a nice new iron for Christmas- so far so good - It is by Hamilton Beach and is a neon blue and black one. Loved the recipe for brussel sprouts - that is one of my favorite vegetables.